With its wood grain panels and dodgeball sized lights lining the wall, Jahn’s really sets the mood for an old school ice cream shop. I felt as if I were on the set of a Back To The Future film (I mean this in a good way). Jahn’s was once a chain that had locations in New York, New Jersey, and South Florida. We arrived near 10PM during a rainstorm and while everyone in my party decided to have some sort of dessert, I had a Vanilla Shake to start with and a Burger, of course. Their BBQ Burger has American Cheese on the bottom and top bun (at least mine did), BBQ Sauce, Bacon and a couple of Onion Rings. 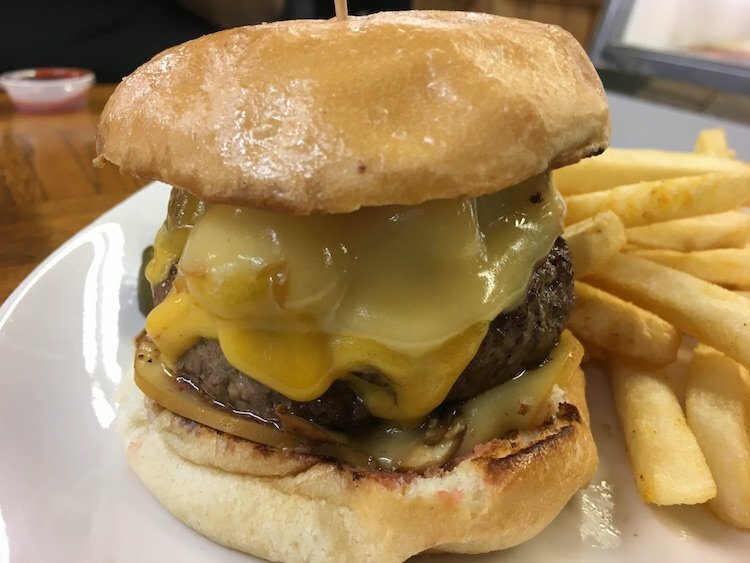 This is your standard Diner Burger. It will satisfy your late night Burger cravings, at least it did for me. As a late night plus they have an extensive dessert menu to look through and indulge in. I frequented Jahn's as a kid. For me, this place was ice cream heaven! It was the first time I ever heard of the kitchen sink–lol. Do they do birthday parties like the Bensonhurst Jahn's did?